For families looking to escape to the country, Lacs de Gascogne offers the perfect luxury camping holiday with activities for the kids to enjoy while their parents relax. Located near — and in sight of — the breathtaking Pyrenees, Lacs de Gascogne is set in a lush 12 hectares forest surrounded by beautiful towns and countryside trails to kick start your family adventure. Back at base, there are lake and poolside activities to make this the perfect luxury camping choice. Set against the beautiful French countryside of Gers, Lacs de Gascogne offers many opportunities for hiking, cycling and exploring the rolling hills and villages in the region. This luxury camping site itself provides many comfortable facilities and services within this wonderful location. With secluded mobile home accommodation surrounded by forest and lakes, book a relaxing camping holiday at Lacs de Gascogne through LuxCamp. Why choose Camping Lacs de Gascogne? On site restaurants offering local gastronomy. Lakeside activities such as canoeing. Multi-sports field and fitness equipment. Playgrounds, kids club and games room for children. 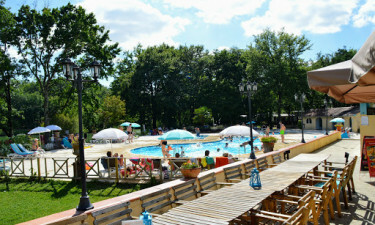 A large outdoor swimming pool with a paddling area for little ones is ideal for the whole family to enjoy. Sun loungers and parasols are poolside for you to kick back and soak up the sun. Lessons and activities are available for children. The local lake offers free canoeing, water rolls and a ferry for you to explore the water. Despite being so far from the coast, the lake offers a sandy beach with a designated fishing area. 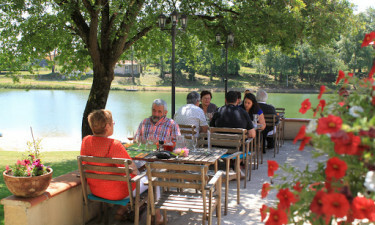 You can also enjoy food and drink on the lakeside terrace.